The 2004 United States presidential election in Colorado took place on November 2, 2004, and was part of the 2004 United States presidential election. Voters chose 9 representatives, or electors to the Electoral College, who voted for president and vice president. 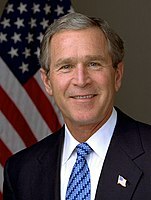 Colorado was won by incumbent President George W. Bush by a 4.67% margin of victory. Prior to the election, 10 of 12 news organizations considered this a state Bush would win, or otherwise considered as a red state, although both campaigns targeted it as the Democratic candidate, John Kerry, was born in Colorado. On election day, Bush did carry Colorado, but only about half the 9% margin he won over Al Gore in 2000. Additionally, Colorado voters decided not to pass a referendum that would have split their electoral vote for this and future presidential elections. As of the 2016 presidential election [update], this is the last time the Republican nominee carried Colorado in a presidential election, as well as Arapahoe County, Jefferson County, Larimer County, Alamosa County, and Ouray County. This is also the only presidential election that Broomfield County, created in 2001, has voted Republican. It was also the first time any candidate received a million votes in the state. The key to Bush's victory in the state was winning the largely populated counties such as Jefferson County, Douglas County, El Paso County, and Arapahoe County. Although nationally Bush did better, his results in Colorado were lower than in 2000. Technically the voters of Colorado cast their ballots for electors: representatives to the Electoral College. 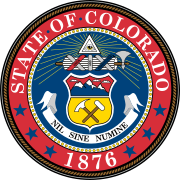 Colorado is allocated 9 electors because it has seven congressional districts and two senators. All candidates who appear on the ballot or qualify to receive write-in votes must submit a list of nine electors, who pledge to vote for their candidate and his or her running mate. Whoever wins the majority of votes in the state is awarded all nine electoral votes. Their chosen electors then vote for president and vice president. Although electors are pledged to their candidate and running mate, they are not obligated to vote for them. An elector who votes for someone other than his or her candidate is known as a faithless elector. There was a Constitutional amendment put on the ballot in the state to alter the way the state's electors would be distributed among presidential candidates, but was rejected by the voters in 2004. ^ "George W Bush - $374,659,453 raised, '04 election cycle, Republican Party, President". www.campaignmoney.com. ^ "John F Kerry - $345,826,176 raised, '04 election cycle, Democratic Party, President". www.campaignmoney.com. ^ "CNN.com Election 2004". www.cnn.com. ^ "U. S. Electoral College 2008 Election - Certificates". www.archives.gov.